Keep up to date with information about Kentucky here. This information covers the counties of Athens, Belmont, Coshocton, Gallia, Guernsey, Harrison, Hocking, Jackson, Meigs, Monroe, Morgan, Muskingum, Noble, Perry, Tuscarawas, Vinton, and Washington. Rural Toolkit: Want better Internet access? Check out this toolkit and then share it with leaders in your community. You don’t have to be an expert on networking to get started on improving Internet access. At the back, it includes a fact sheet for the region -- also available separately. 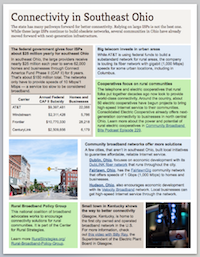 Fact sheet for Southeast Ohio: Learn about what other communities in Ohio have done to improve Internet access. Consider how big companies receive subsidies to built obsolete networks that only need to provide speeds of 10 Mbps download and 1 Mbps upload. Information on every one of these counties is available in this Dropbox folder. Each county map outlines where there is any form of Internet access. Then it specifies the technology: DSL, Fixed Wireless, Cable, or Fiber-to-the-Home. Fiber-to-the-Home can provide speeds that are much faster than “broadband.” Now available: updated county maps made with FCC Form 477 June 2016 Version 2 data. (07/2017). Read more about what communities are doing to improve Internet access in Ohio. This information covers the counties of Calhoun, Doddridge, Gilmer, Jackson, Marshall, Mason, Pleasants, Putnam, Roane, Tyler, Wetzel, Wirt, and Wood. 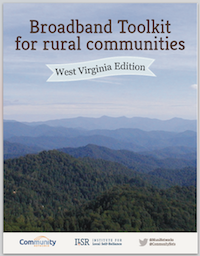 Rural Toolkit: This packet has all the information you need to get started. It goes over the importance of Internet service and how other communities and cooperatives have built their own networks. 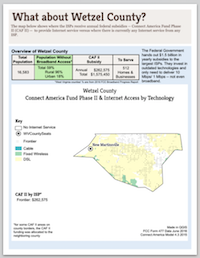 At the back, it includes an overview of connectivity in these counties -- this fact sheet is also available separately below. Fact sheet for northern West Virginia: How can Internet access improve healthcare? How much is the federal government giving Frontier to build last-generation networks? Learn the details on the fact sheet. Find more information about West Virginia here. It’s not just about Internet access. People need affordable, reliable, high-speed Internet service to take advantage of the new economy. From healthcare and education to jobs, Internet service is not a luxury, but a requirement. Check back for more! We intend to publish information for additional states and counties in the near future. Note: The previously released version of these county maps were based on June 2016 Form 477 Version 1 Data and the GIS program had layered DSL on top of Fiber and Cable in some areas. The updated maps use the latest data and the layering has been fixed to show the Fiber availability. 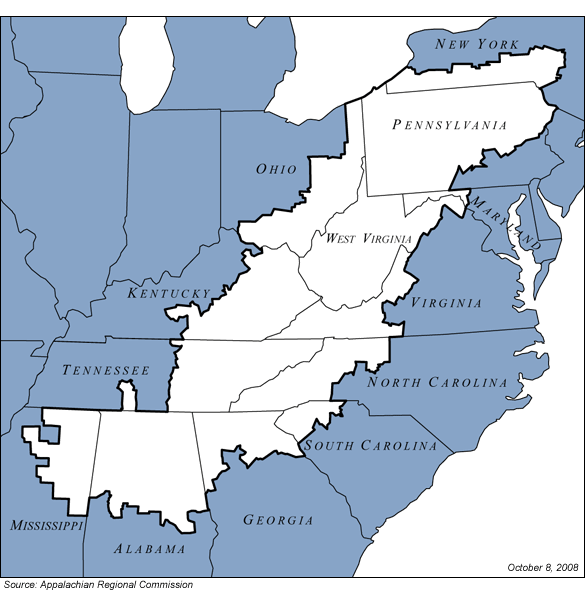 Public domain image of Appalachia map from Appalachian Regional Commission.